YEREVAN—Armenian Serzh Sarkisian received the Co-Chairs of the OSCE Minsk Group, Ambassadors Igor Popov of Russia, Stephane Visconti of France and Richard Hoagland of United States, and the Personal Representative of the OSCE Chairperson-in-Office, Ambassador Andrzej Kasprzyk on March 27 in Yerevan. According to the Armenian presidential press service, the meeting discussed the peaceful settlement of the Artsakh (Nagorno-Karabakh) Republic as well as the current situation along the Artsakh-Azerbaijani border—also known as the Line of Contact. The Co-Chairs briefed Sarkisian on the details of their March 10 meetings in Baku. The sides highlighted the importance of committing to the peaceful settlement of the conflict, as well as the necessity to implement the agreements reached at the Vienna and St. Petersburg summits. 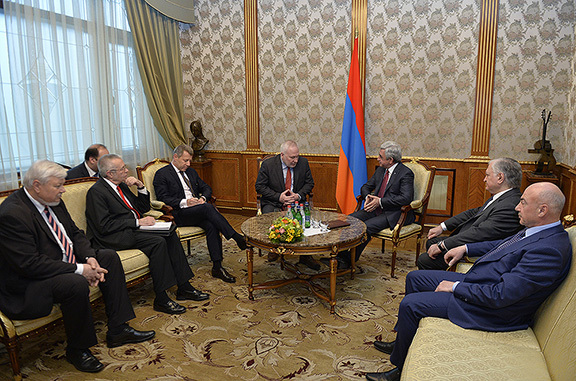 Armenian Foreign Minister Edward Nalbandian was present at the meeting. Nalbandian met with the Co-Chairs in a separate meeting on Monday and shared the results of their meetings in Azerbaijan. The interlocutors discussed ways of furthering the Karabakh settlement process, emphasizing the importance of implementation of the agreements reached at Vienna and St. Petersburg summits. During the March 27 press conference, Hoagland told reporters “In Baku we met with President Aliyev, Foreign Minister Mammadyarov. I cannot say what we have discussed; it is not accepted in diplomacy.” I can assure you that we have talked about the agreements reached in Vienna and St. Petersburg. We believe that such confidence-building measures maintain their relevance and they must be implemented,” Hoagland continued. Hoagland said that the Co-Chairs would be visiting Stepanakert on Tuesday, where they will meet with Artsakh authorities. “Tomorrow we are departing for Nagorno-Karabakh; we will meet with the authorities of Stepanakert. We cannot view violence as a solution for this long lasting issue. Violence isn’t a way out; we must try to find the most positive solutions. Our issue is to work together, stand together and encourage the negotiations process, in order for it to continue,” Hoagland said.